Wow! 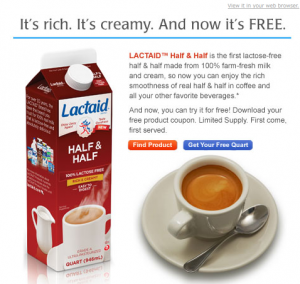 Here is a great coupon for a FREE Lactaid Half & Half. Again, some stores will not take internet printed coupons for free items so please check with your store first before you head to checkout. There is a limited quantity of these coupons available. The coupon is a bricks coupon. Coupon is void in MA.